This is the last week of school and crunch time for Ro-Jiro. He has final exams starting from today until Thursday. He has been hard at work this entire weekend and so we have kept activities to a minimum. You can be sure we will all be glad when it is over. Since the weather is still pretty cool and there wasn’t much going on, I decided it was time to cook this rich and robust Red Wine Beef Stew. I had a bottle of dry red wine on hand and this was a recipe I have been wanting to cook some time now. Thus far, I have never used so much wine in a single dish as I often wondered how much of the alcohol actually evaporates during cooking. According to this source, it is dependent on how long the alcohol is simmered and baked. It does take up to a good 3 hours of cooking to eradicate all traces of alcohol. 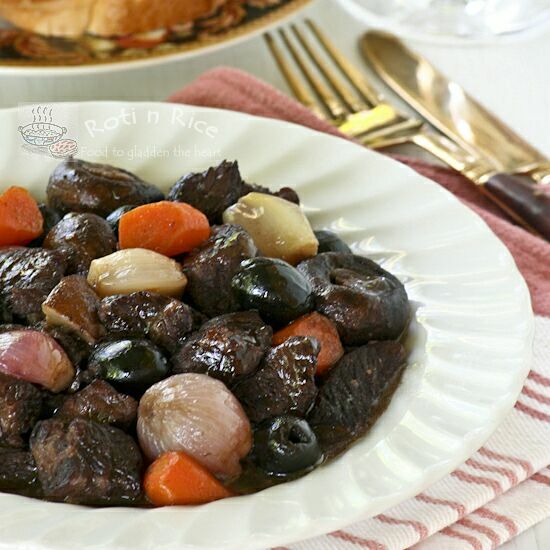 This Red Wine Beef Stew would have about 20% of alcohol remaining after 1½ hours of simmering. So, this is definitely a dish for the adults. This is a very flavorful dish indeed but if you are concern about the alcohol, please use apple juice instead of red wine. Apple juice will give the stew a sweeter flavor. 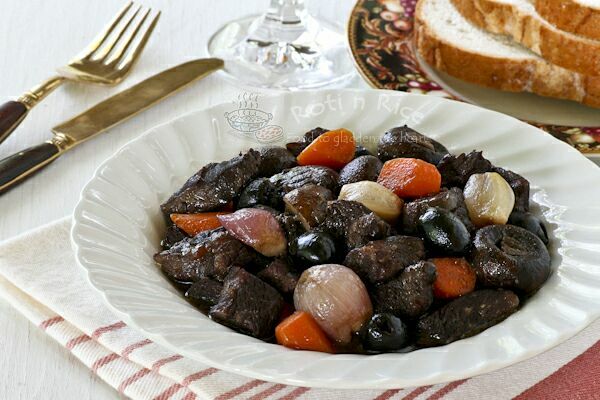 Do check out this Beef and Bean Stew cooked with apple juice. I think you can’t go wrong using either liquid. 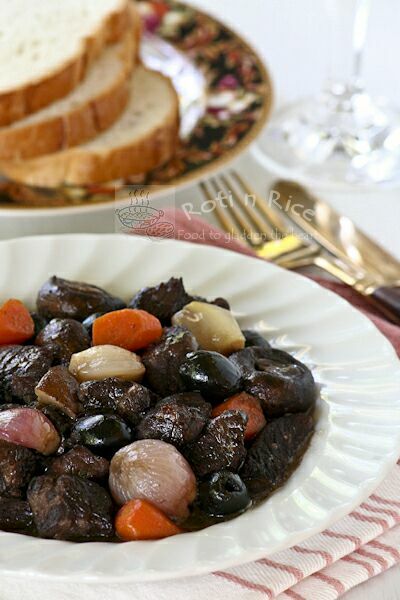 The recipe below was adapted from Jacques Pepin’s Beef Stew in Red Wine Sauce. I used shallots in place of pearl onions because that was what I had in my pantry. I did not want to make a trip to the store for just one item. This delicious stew is wonderful eaten with crusty bread, mashed potatoes, or noodles. Do give it a try. BTW, it’s starting to get warmer here, between 19C to 22C. Heard it’ll be dry and sunny in the weekend at 25C – a big leap from 6C to 10C we had last week! Glad to hear it is getting warmer over at your corner. It is still wet and rainy here. Pretty cold too as it is currently only 53 deg F (12 deg c)…brrr! Hopefully, it will warm up soon.